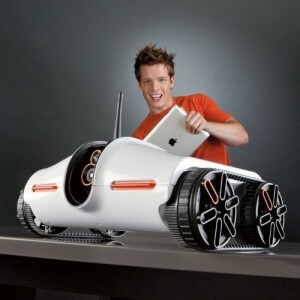 The Rover Spy Tank is app-controlled via your iPod touch (2nd, 3rd and 4th generation), iPhone device, or iPad tablet. It generates its own Wi-Fi wireless connection for your smart device (no frequency interference). The impressive wireless range lets it travel up to 200 ft. unobstructed, up to 100 ft. around walls into other rooms. Navigate it with the on-screen driving arrows or use the G-Drive Mode that uses your devices accelerometer like a steering wheel in your hands. To get started, downlo…Drive Rover with your iPod touch (2nd, 3rd and 4th generation), iPhone device, smartphone or iPad tablet.